Patrick J. Kennedy, the former congressman and youngest child of Senator Ted Kennedy, details his personal and political battle with mental illness and addiction, exploring mental health care's history in the country alongside his and every family's private struggles. On May 5, 2006, the New York Times ran two stories, “Patrick Kennedy Crashes Car into Capitol Barrier” and then, several hours later, “Patrick Kennedy Says He'll Seek Help for Addiction.” It was the first time that the popular Rhode Island congressman had publicly disclosed his addiction to prescription painkillers, the true extent of his struggle with bipolar disorder and his plan to immediately seek treatment. That could have been the end of his career, but instead it was the beginning. Since then, Kennedy has become the nation’s leading advocate for mental health and substance abuse care, research and policy both in and out of Congress. And ever since passing the landmark Mental Health Parity and Addiction Equity Act--and after the death of his father, leaving Congress--he has been changing the dialogue that surrounds all brain diseases. A Common Struggle weaves together Kennedy's private and professional narratives, echoing Kennedy's philosophy that for him, the personal is political and the political personal. Focusing on the years from his 'coming out' about suffering from bipolar disorder and addiction to the present day, the book examines Kennedy's journey toward recovery and reflects on Americans' propensity to treat mental illnesses as "family secrets." Beyond his own story, though, Kennedy creates a roadmap for equality in the mental health community, and outlines a bold plan for the future of mental health policy. Written with award-winning healthcare journalist and best-selling author Stephen Fried, A Common Struggle is both a cry for empathy and a call to action. The Honorable Patrick J. Kennedy is a former member of the U.S. House of Representatives and the nation’s leading political voice on mental illness, addiction, and other brain diseases. During his 16-year career representing Rhode Island in Congress, he fought a national battle to end medical and societal discrimination against these illnesses, highlighted by his lead sponsorship of the Mental Health Parity and Addictions Equity Act of 2008--and his brave openness about his own health challenges. The son of Senator Edward “Ted” Kennedy, he decided to leave Congress not long after his father’s death to devote his career to advocacy for brain diseases and to create a new, healthier life and start a family. He has since founded the Kennedy Forum, which unites the community of mental health, and co-founded One Mind for Research, which sponsors brain research and open science collaboration. He lives in New Jersey with his wife, Amy, and their four children. Stephen Fried is an award-winning magazine journalist, a best-selling author and an adjunct professor at Columbia University Graduate School of Journalism. He is the author of two books on healthcare, mental health and addiction--Bitter Pills: Inside the Hazardous World of Legal Drugs and Thing of Beauty: The Tragedy of Supermodel Gia—as well as The New Rabbi, Husbandry and his recent historical biography Appetite for America: Fred Harvey and the Business of Civilizing the Wild West—One Meal at a Time, which was a New York Times bestseller. Fried lives in Philadelphia with his wife, author Diane Ayres. “A stunningly unvarnished portrait of one of America’s most private public families..."
"[Patrick Kennedy] has undeniably turned his fame toward a good cause — of raising understanding about the prevalence of mental illness and addiction in our society, and the need to help our brothers and sisters who cannot help themselves. There are easier ways to make money than speaking out honestly about one’s own life, and we admire the courage Mr. Kennedy has shown in discussing these difficult issues." "Fascinating ... This book is a must-read, not only for those suffering from mental health and substance use disorders, but also for the professionals who treat them and for those who pay for that treatment." “I think Patrick Kennedy is quite courageous for bringing this book out. ... What he is doing is really the equivalent of what Betty Ford did when she exposed her own alcoholism." 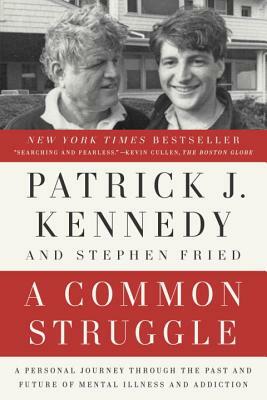 "Patrick Kennedy should receive a profile in courage award for his book, A Common Struggle..."